GIS and Geostatistical Techniques for Groundwater Science provides a detailed synthesis of the application of GIS and geostatistics in groundwater studies. As the book illustrates, GIS can be a powerful tool for developing solutions for water resource problems, assessing water quality, and managing water resources. 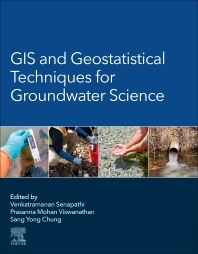 Beginning with an introduction to the history of GIS and geostatistical techniques in groundwater studies, the book then describes various spatial techniques, including case studies for various applications, from quality assessment, to resource management. This book assembles the most up-to-date techniques in GIS and geostatistics as they relate to groundwater, one of our most important natural resources. Dr. Venkatramanan Senapathi is a Research Professor and Postdoctoral Fellow in School of Earth Environmental Hazard System, Department of Earth & Environmental Sciences, Pukyong National University, Busan, South Korea. He obtained his PhD in Applied Geology at Department of Earth Sciences, Annamalai University, India. His doctorate research work integrates the sedimentology, with the environmental geochemistry of trace metals especially on the solid speciation metals to understand their variable reactive nature. He is working in the field of Environmental Geochemistry of water and sediments for the past 7 years and currently focusing on groundwater quality management using GIS, DRASTIC, Fuzzy and ANN models. He has published more than 50 research articles in referred indexed journals. Dr M.V. Prasanna joined Curtin University, Sarawak Malaysia in August 2008. He completed his Ph.D degree in 2008 at Annamalai University, India. He is working in the field of environmental hydrogeochemistry for the past 7 years and currently focusing on monitoring and assessment of metal pollution in water bodies at different environment. He has published more than 50 research articles in refereed journal with high impact factor. He has currently supervising four research students at master and Ph.D levels. Prof. Sang Yong Chung is a full Professor in the Department of Earth & Environmental Sciences, Pukyong National University in Busan City of Korea. He accomplished the Ph.D. program in Hydrogeology from the Department of Geological Sciences, University of Nevada at Reno, U.S.A. He was interested in the modeling of groundwater data such as aquifer parameters, water level and water quality using geo-statistical methods. Recently, he is studying in the field of the management and conservation of groundwater through hydrogeochemical and geo-statistical studies. He published more than 70 research articles in referred indexed journals.